Ansonia Clock Co., "Crystal Palace No. 1 Extra", ca 1875. 8 day signed Ansonia movement, bell strike, Geneva stopworks. Statues came either gold or silver, this old set is silver. Other accessories like oar, harpoon, bell, bezel, and pendulum, are brass. New paper dial. This model was made by H. J. Davies and was first shown in the Waterbury Trade Catalog of 1875 and in the Ansonia catalog of 1880. Pendulum is the correct one for this clock. The case is 18 1/2 inches with the heavy, probably replaced, glass dome. 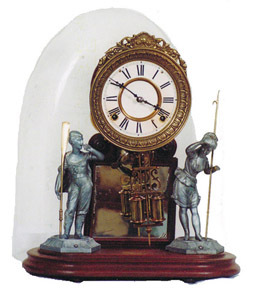 See Ly-Ansonia, pages 91 thru 94 for pictures and discussion of these clocks.